Glenn Irwin hopes to pass a fitness test to continue racing at Donington Park following a crash in opening practice on Saturday. Glenn Irwin has been passed fit to race at the opening round of the Bennetts British Superbike Championship at Donington Park following a crash on Saturday. The PBM Be Wiser Ducati contender came off at Goddards in wet conditions during the first free practice session at Donington Park, bringing out the red flag. Irwin was treated at the track before being transported to Queen’s Medical Centre in Nottingham. 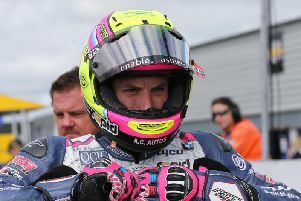 The Carrick man tweeted that he had sustained a ‘broken neck’ but later on Saturday afternoon, he provided an update and said he hoped to continue racing at Donington. Irwin wrote: ‘Turns out when I broke/dislocated my elbow/shoulder at Knockhill last year I also broke my neck. Old fracture – stiff as a board but I’ll be passing the fitness test tomorrow’. Irwin was later delcared fit to race after returning to Donington Park on Saturday afternoon.